Rinse the beans, and place into a large pot – pour in enough water to cover by at least 2 inches. Soak the beans overnight; drain and rinse the following day, and set aside. Heat oil in a dutch oven (or deep skillet), and add the onions with salt – cook until translucent and slightly caramel in color , 7 to 8 minutes. Add the garlic and tomato paste, and cook for an additional minute. Add the spices, and stir until just fragrant. 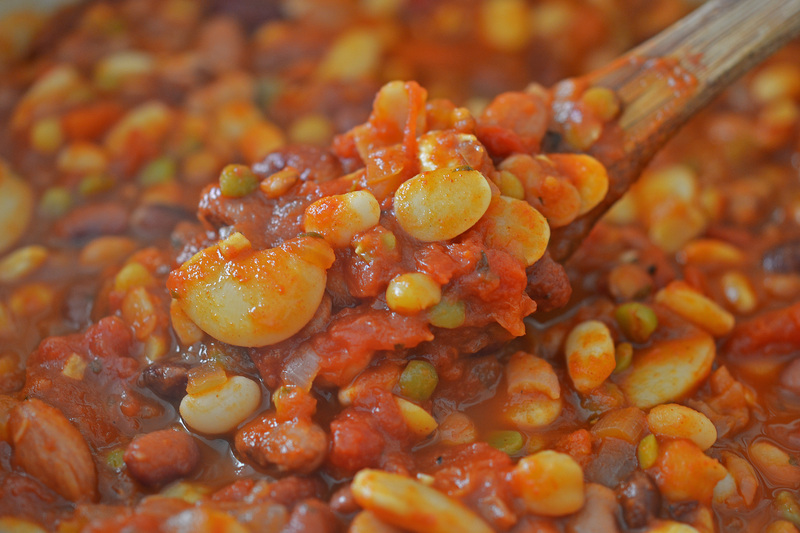 Stir in the canned tomatoes (with juices) and beans; fill one of the empty tomato cans with water and add to the pot. Bring to a boil, then reduce to a simmer and allow to cook, covered, for 20 minutes. Remove the lid and allow to cook for an additional 5 to 10 minutes (checking the texture of the beans regularly). Stir in the liquid smoke, and allow to cook for an additional minute or two; season to taste with salt and pepper. Serve warm – will keep in the refrigerator for up to a week, and up to 3 months frozen.